Boulevard Music not only keeps musicians supplied with strings, picks, and reeds, it offers a place to perform, network and train the next generation. 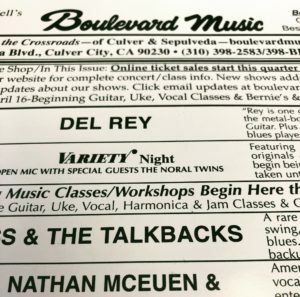 Boulevard’s main room displays a wide selection of new instruments, particularly Martin, Fender, and Cordoba guitars, as well as band and orchestra instruments, amplifiers, and some carefully curated used gear. Available brands and models are suitable for beginners to professionals, as well as collectors. Sales staff are also musicians, eager to demonstrate and discuss the merchandise. 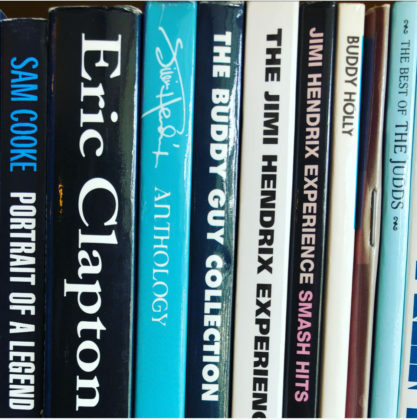 Bookcases at the front of the store hold songbooks, mostly by singer-songwriters and classic rock bands, and instructional books from beginning band methods to advanced classical guitar technique and jazz theory. Accessories, such as picks and strings, are behind the counter. 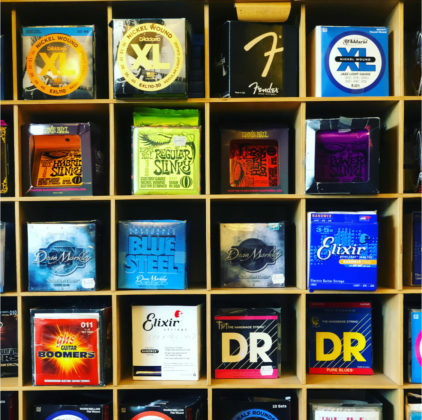 Guitar strings behind the counter at Boulevard Music. On most weekend nights, the guitar and stands are cleared from the floor, and replaced with folding chairs to transform the shop into a small theater, hosting concerts by local and national acts, in a variety of mostly acoustic and guitar-based styles, including bluegrass, Americana, blues, Gypsy jazz, Irish, Brazilian, and Cuban music, flamenco, singer-songwriter, and roots rock, plus national champion banjo, fiddle, and fingerstyle guitar players. Boulevard Music hosts live music performances every Saturday and Sunday night. 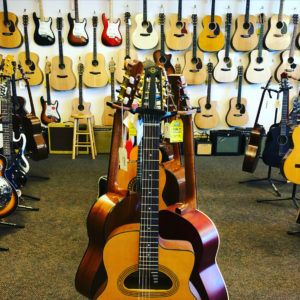 The large building includes a full repair shop for acoustic and electric guitar family instruments, as well as brass and woodwinds, and it’s an authorized warranty service center for Martin, Fender, and other major brands. 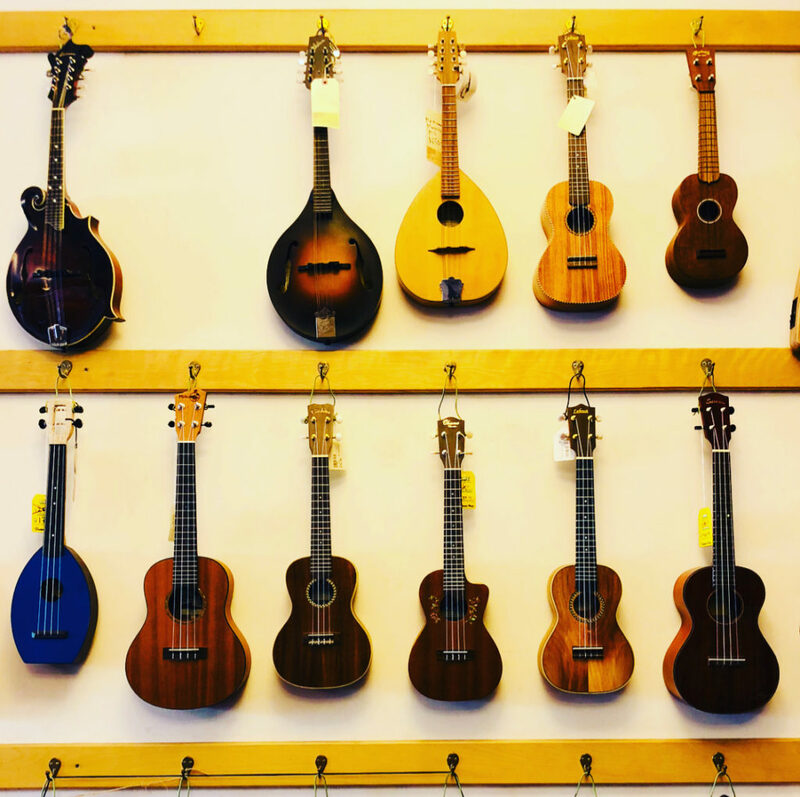 There are also studios for individual lessons on all band and orchestra instruments, guitar, mandolin, electric bass, ukulele, mandolin, banjo, and drums. These lessons are a popular supplement to school music programs. Group classes and workshops are an economical option and a great opportunity to meet and play with other musicians. 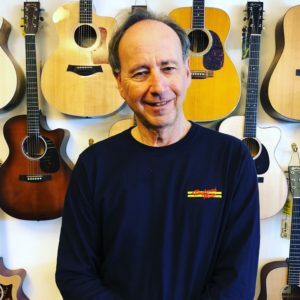 Gary Mandell, owner of Boulevard Music. While online sales threaten many shops, repairs still need to be done in person. Watching a concert or taking a lesson online, even by Skype or Facetime, is not the same as being there. On-location lessons further fuel a sense of community and can serve as an intensive addition to Culver City schools’ music programs. Customers have traveled long distances to get to Boulevard, to try high-end Martins and other handcrafted instruments. Listing these items online has helped draw people to the store. Boulevard Music not only keeps musicians supplied with strings, picks, and reeds, but offers a place to perform and network, train the next generation, and help performers supplement their income by working as teachers and salespeople. They are an important part of our creative infrastructure.